Growing up, I spent a lot of time in my grandmother’s kitchen in Texas. Sundays were my favorite. It was a day of family and football, a day where Grandma Shelly and my aunts gossiped and cackled and smacked their tongues and braided hair and cooked collard greens and cornbread. Black girl magic surrounded me. There was magic in the ordinary. And as I grew older and left the comfort of grandma’s kitchen – that magic seemed to fade – especially when I watched movies or read magazines. Black girls exist in a culture where we are told we are pretty (for black girls), where our hair and our booties are deemed public property, where we’re either someone’s side chick or baby’s mother. We exist in a culture where our baby hairs are not ours, where our full lips are not ours, where our cornrows and our fros are not ours, where the magic we create is not ours…it’s everyone’s. To be simultaneously copied and erased is our plight. It’s why when we are actually seen and centered, from Teen Vogue to Essence it’s a cause for celebration. 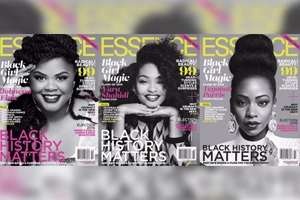 When I got my hands on copies of Essence’s special Black Girl Magic issue, featuring Teyonah Parris, Netta Elzie & Yara Shahidi, I felt like a kid again. But for Linda Chavers, the issue triggered her and propelled her to interrogate Black Girl Magic in a thought-provoking piece for Elle.com. Chavers has a point here – particularly that black girls and black women are made to fit into narrow archetypes that limit our humanity, that tell us we cannot be both vulnerable and strong, that we cannot twerq and get a degree, that we cannot be. But there is a vital space, a necessary space where we must – for our communal benefit — make such proclamations about ourselves and lift one another up. Black Girl Magic is more than a statement or a slogan. Black Girl Magic is a centering, a centering of ourselves, a centering of our greatness, a centering of our individual triumphs and an acknowledgement, a public acknowledgment, of our collective victories. Black Girl Magic is Viola Davis bringing Harriet Tubman on the Emmy stage. Black Girl Magic is Serena Williams taking her throne. Black Girl Magic is Laverne Cox telling us that no matter our path to girlhood, we are beautiful. And Black Girl Magic is Ava Duvernay becoming a damn Barbie, and selling out in near minutes. To openly proclaim that Black girls are magic is not to erase the nuance, the complexity, the struggle of our existence. No. Proclaiming Black Girl Magic is the in-the-face of injustice…in-the-face of our communities being plagued by violence and HIV, prisons and policing, is to protect our girls and the little girls in inside us from being forced out of girlhood because of circumstance. Black Girl Magic protects her….Lets her sit here for a little while longer, lets her bask in her own bubbly, brilliant, blackness. Black Girl Magic is a resounding reclamation.